Should this vital supplement be a part of your dietary strategies? You'll read about it in the latest scientific reports and in the works of Pliny the Elder in 1 AD. It was noted by Columbus sailing the Atlantic and is farmed in the Pacific. It has a protein quality only slightly above that for shoe leather, yet has saved countless lives and has killed a few as well. Kelp. The stuff of legend, medicine, and chameleon nutrition because of one - and only one - feature. Iodine. Let's start at the end, with iodine, and work back to kelp. The first nutrient to be recognized as essential for animals and humans, iodine plays a critical role in metabolism. Iodine is a trace mineral that is required in the diet because it cannot be made by the body. Dietary iodine is absorbed in the small intestine. In the species studied (mammals), about 30% of absorbed iodine is taken up by the thyroid gland. The remaining iodine is mostly excreted in urine, with a small amount excreted in feces and, in mammals, sweat. Iodine has only one function in the body, but it is crucial for health and life itself. Iodine is a component of hormones secreted by the thyroid gland. Iodine joins with the amino acid thyronine (monoiodothyronine, MIT, and diiodithyronine, DIT), and is part of triiodothyronine (T3), thyroxine (T4), and thyroglobulin (the storage form of thyroid hormones). These hormones (T3 and T4) are under control of thyroid, pituitary, brain, and feedback messages from peripheral tissues. The hormones influence rates of oxidation in cells, thus affecting physical and mental functions including growth and function of brain and nerve tissue, muscles, and so on. Moreover, by its function in energy metabolism, iodine influences the metabolism of every other nutrient. Remember in the first issue of this magazine we opened with a discussion on energy, and how everything in chameleon clinical nutrition grows from this deeply rooted starting point. Iodine is one of the controls of energy metabolism, and energy needs in turn control the animal's iodine requirement. Iodine deficient soils in the US were associated with goiter prior to the development of iodized salt and when only local foods were consumed. These areas include the Appalachian Mountain chain from NY to WV, the Great Lakes area and Pacific Northwest as well as Rocky Mountain states. Every inhabited continent of the world contains iodine deficient areas. These include such chameleon corners as Madagascar and central Africa (data from World Health Organization, Geneva). Veterinarians still see iodine deficiency in animals (such as tortoises) grazing or eating hay from iodine-deficient areas around the Great Lakes, for example. The problem can travel up the food chain in areas of the world where goiter is (or was) endemic (common). Let's move down the food chain to chameleon food. Do invertebrates contain iodine? The limited studies of iodine focus on only a few insect species. These showed little or no iodine within insects, and no dietary requirement. Insects don't have a true thyroid gland, although crickets contain a few "thyroidal follicles" in the striated muscle of their hind legs. 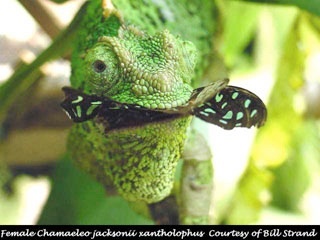 The story changes, however, when considering insects as food for chameleons, for we want crickets to thrive but also provide, either in them or on them, the nutrients considered essential for chameleons. Deficiency of iodine causes hypothyroidism (other factors can cause this, too). It is termed goiter in mammals, and is characterized by an enlarged thyroid gland. Iodine deficiency causes stillbirths and abortions, as well as prolonged gestation, congenital malformations, mental retardation, dwarfism, stunted growth, skin problems, reduced metabolic rates, and increased mortality. Iodine deficiency is less well documented in reptiles compared to mammals, but it occurs routinely in tortoises, with undocumented cases in other reptiles, whenever dietary iodine is in short supply. Regardless of the species, a patient with iodine deficiency fails to thrive, grow, stay healthy, or live long. A complete lack of dietary iodine can be subtle and mild to start, but progresses if untreated to a severe, debilitating, fatal disease. A lower than optimal level of dietary iodine can result in problems that are vague and insidious, including poor reproduction. It is rare that a nutritional disorder affects 100% of a population. Regarding iodine deficiency in humans, 10% of those in iodine-deficient areas show clinical goiter. I've seen higher rates in groups of captive reptiles, but generally iodine deficiency cannot be ruled out even if most chameleons in a collection appear healthy. Iodine deficiency is diagnosed by clinical signs and histories of reproduction and growth, a diet history of low iodine intake, and low blood levels of thyroid hormones. Treating iodine deficiency is essential, but far better is preventing the problem. That's where kelp comes in. A feature of sick animals sometimes includes low thyroid activity. These animals are not truly hypothyroid, but are responding to their disease and to lack of adequate food intake. Thus low serum concentrations of thyroid hormones can reflect illness and not iodine deficiency. Consult your veterinarian before dosing a sick chameleon with kelp or any other iodine-containing product. A Note for Veterinarians: A form of hypothyroidism has been associated with selenium deficiency. The deiodinase that converts T4 to T3 contains selenium. This condition is characterized by increased plasma concentration of T4 and decreased T3. To date, it has been described only in mammals but needs to be kept in mind for reptiles raised on foods from selenium-deficient regions. Too little iodine leads to reproductive failure and loss of captive-bred offspring. However, too much iodine causes almost identical signs and lesions. Iodine intake with each meal is recommended, but supplementation must be done carefully and calculation of dosages is recommended. Moreover, anything that affects the availability of iodine may interfere with iodine and increase requirements. Iodine-deficient soils occur worldwide, but other causes of goiter include the presence of dietary goitrogens. These iodine inhibitors are found in bok choy, broccoli, cabbage, cauliflower, kale, mustard seed, rapeseed, and turnips. These plants do not have to be avoided entirely but should be fed only intermittently. The specific amounts of these foods that can be tolerated safely in diets for reptile prey require further study. Iodine intoxication presents as goiter, identical in appearance to iodine deficiency, because of impaired utilization of iodine. In domestic mammals, there are clinical cases of goiter in offspring following over-dosage of the dam. Iodine may be supplemented as iodized salt and as kelp in powder or tablet form. Iodized salt contains 0.01% potassium iodide or 76 micrograms (mcg) iodine/gram (g) of salt; one teaspoon of salt weighs about 4 gm. About 13% of the salt sold in the United States derives from the sea; other sources are mines and brine wells. Sea water that has been evaporated by the sun is often marketed as solar salt. Salt from the sea has minerals removed in order to be sold as table salt; these minerals are then reinserted to market the product as sea salt, which increases product cost. Low-sodium salts contain potassium chloride mixed with sodium chloride; these can also contain iodine. Kelp is one of a confusing list of names applied to seaweed. Used for centuries as a food item, kelp contains a wide variety of other trace minerals in addition to iodine. Dried kelp for human or livestock consumption contains about 5% protein (low biologic value), 7% fiber, 1.9% calcium, and 0.2% phosphorus. For farmed kelp, average iodine content is 0.062% or 620 mcg/g, about eight times the iodine content of iodized salt (data from the Norwegian Seaweed Institute). In Norway and Japan the kelp industry is well-organized, with product regulation. However, products sold in the United States, in health food stores for example, often escape such regulation and one cannot assume that quality control has been achieved. Product contamination may have occurred, as well as errors in labeling. Kelp products should be used with care, with specific intakes calculated, in order to avoid risk of toxicity. Try to buy high-quality kelp, preferably a product approved for human consumption and derived from farmed sea-beds. One last form of iodine supplement is the alcohol-based tincture of iodine. It's best diluted in quality vodka, one drop per ounce, mixed with shaved ice, tonic and fresh limes, then enjoyed by chameleon keepers on hot summer nights when the work is done. (1) Check ingredients of your cricket foods - Check labels of any commercial foods, and look at ingredient lists for either kelp or iodine to be listed. Because it is added in trace amounts, iodine will appear near the end of ingredients. It will be listed as potassium iodide, sodium iodide, etc. (2) Note intakes of foods by crickets - Consider how much of the iodine-containing foods are consumed by your crickets, relative to their other foods. Generally, foods containing a full complement of trace minerals and vitamins don't taste as good as fresh greens, fruits and vegetables. If your crickets eat the fresh offerings and leave the balanced foods, it may be time to try a different food plan (such a reducing the commercial food to a powdery substance and mixing it with the fresh stuff). (3) Evaluate fresh foods for those high in goitrogens (iodine inhibitors; see above). If these are present, limit their usage to once weekly. (4) Examine supplements dusted onto prey - As for cricket foods, look at labels of dusts for kelp or iodine in the ingredient list. (5) Evaluate the calcium intake of your chameleons - Calcium?? Unfortunately, high levels of dietary calcium interfere with iodine uptake. (6) Find out the iodine status of your area - This is vital if you're (a) feeding wild insects to your chameleons, or (b) feeding local wild plants to your crickets (or local horse manure to your superworms). A check with your local Agriculture Extension agent should provide the information, and there are maps of iodine levels on the internet. (7) Examine your chameleons and records of breeding, clutch sizes, hatchling viability, and growth rates. If you're feeding iodine already, and you're happy with the performance of your chameleons, don't change a thing. Iodine is toxic (I'll only mention this another two or three times) and you don't want to risk overdosage. If you're heavy handed with iodine inhibitors, such as kale fed to crickets and excessive calcium dusting, aim for a better balance between the inhibitors, iodine, and calories. If you're not already offering iodine in foods or dusts, consider adding a judicious amount of kelp to your cricket food. Iodized salt is not recommended here because sodium can be deadly to crickets and you want to closely control sodium intakes in your chameleons. I aim for about 0.3-0.8 mcg iodine per calorie of cricket food. Use kelp supplements that provide iodine concentrations on the label (or if necessary, use the data above for kelp) when calculating dosages. A problem, however, with this technique is that you won't know how much iodine, if any, is reaching the thyroid gland of your chameleon. We're depending on iodine to be absorbed by the cricket (not entirely likely) or held in sufficient quantity in the cricket's intestines (also not entirely likely), to then be absorbed in sufficient quantities in the chameleon's small intestine, be picked up by binding proteins and to travel to the thyroid gland for uptake and metabolism. I'm uncomfortable putting that much faith in a system that remains unstudied and fallible when the nutrient is as crucial as iodine. To ensure adequate intakes, one may also consider adding iodine to dusts, with much caution taken not to add toxic levels. In this instance, iodized salt can be used as well as kelp. The salt will be safer, because it contains less concentrated iodine, and provides needed sodium to chameleons. Sodium is a macromineral important for cell metabolism and water balance, and may play a role in chameleon edema. More on this another day. If you're concerned about iodine status in your chameleons because of low iodine intakes and declining reproductive performance, you'll want further examination of your chameleons and their foods. You'll need to discuss with your veterinarian the risks and benefits of venipuncture in your chameleon. It may not be necessary to measure thyroid hormones, and, moreover, your vet will want to rule out other problems. Of no risk, however, is food analysis. Samples of your cricket diet and dusts can be analyzed for iodine content for moderate fees. I use Woodson-Tenant Laboratories and an internet search will find their lab closest to you. The ancient Chinese offered kelp to their ancestors and wrote poetry about this iodine-containing seaweed. Most of us won't be as reverent or creative about kelp, but we can consider this vital supplement in our chameleon feeding strategies. Need Help with Diet Calculations? Send me an email (WalkaboutF@aol.com) and I'll try to help (though it may take a few days or a week for a reply! ).